Phillips 66 Bayway Refinery has, once again, come to the rescue of Trinitas Regional Medical Center’s Emergency Services Program, this time, just in time for the holidays. 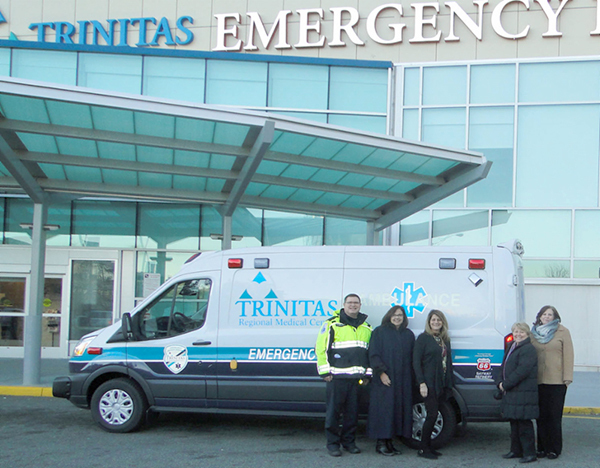 The most recent grant from Phillips 66 in the amount of $81,300 has enabled the purchase of an urgently needed, new ambulance for the Trinitas Emergency Services Program. The Trinitas MICU and Ambulance Unit teams provide primary emergency services to Elizabeth and backup services to Phillips 66 Bayway Refinery’s hometown of Linden, as well as Rahway, Union, Roselle, Roselle Park, Clark, Cranford, Newark, Hillside, Irvington and Kenilworth. In 2017, they responded to 273 dispatches in Linden and Rahway alone, where they provided emergency treatment and transportation to people who live and work in these towns. In 2014, Phillips 66 Bayway Refinery was the major donor of a new, high-tech specialty ambulance that provides a higher level of transport for critically ill patients. The Specialty Care Transport Unit dispatched to more than 1,200 calls, which means that more than 600 patients were transported as emergency MICU paramedic calls, and more than 300 inter-facility transports of critically ill patients were completed. (above, l-r) Gerard Muench, Director of Pre-Hospital Services at Trinitas; Nancy Sadlon, Public Affairs Manager, Phillips 66 Bayway Refinery; Mary Phillips, Community Relations Coordinator for the Refinery; Nadine Brechner, Vice President/Trinitas Health Foundation, Chief Development Officer; and Kathleen Mulligan-Shelvin, Director, Resource Development/Trinitas Health Foundation.